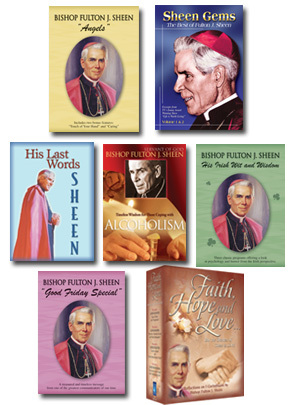 Titles include: Sheen Gems, Timeless Wisdom for Those Coping with Alcoholism, His Last Words, His Irish Wit and Wisdom, Angels, The Good Friday Special and, Faith, Hope and Love - a boxed set including four 55-minute volumes, each with two messages. As seen in the January 2010 issue of Liguorian: Buy all seven Sheen titles listed here and save $80.00! Titles include: Sheen Gems, Timeless Wisdom for Those Coping with Alcoholism, His Last Words, His Irish Wit and Wisdom, Angels, The Good Friday Special and, Faith, Hope and Love - a boxed set including four 55-minute volumes, each with two messages. Here are excerpts remastered from many of Fulton J. Sheen’s Emmy Award Winning Television Programs titled, "Life is Worth Living. "Sheen's presence and sense of drama have crossed time and distance. His words of wit and wisdom transcend the years. His eloquence portrays the sacred truth that in every human heart there is a struggle known only to the soul and God. Pope John Paul II used Sheen's tapes to practice English. Dr. Robert Schuller writes, "He was the first Evangelist from whom we all learned." Rev. Billy Graham calls Sheen "the greatest communicator of the 20th century." "We may not be able to meet in the same pew but we can all meet together on our knees in prayer." Alcoholism destroys lives and injures families. Fortunately there is hope! The time-tested wisdom and compassion of Bishop Fulton J. Sheen for those coping with alcoholism has been gathered in this special three-part collection of messages. Here Bishop Sheen offers solutions. The devastation and hurt can give way to healing through the Lord Jesus. Troubled lives can find peace. Sheen offers hope that alcoholism can be addressed if one reaches out for help from God as well as from family and friends. Sheen shows that one must be willing and search, but that once the Divine is introduced, we come to see how so often "God is the God of a second chance." On Good Friday, 1979, a television crew visited St. Agnes Church in New York to tape a news piece. They were so enthralled by the speaker, Bishop Fulton J. Sheen, they taped his entire talk. This long lost tape has now been found and digitally remastered. It is titled "His Last Words." Bishop Sheen died later that year. This is the Bishop at his best: in a pulpit, not a TV studio. It is a new Sheen experience seen here for the first time. The Bishop's wit and wisdom transcend the years. His words remain a masterpiece of sacred prose and poetry. In "Psychology of the Irish," Bishop Sheen offers his thoughts on what makes a person Irish. Is it ethical? Environmental? Or wishful thinking on the part of those who are not Irish? God has a sense of humor, at least in Bishop Sheen's mind, and he explores that sense of humor in "The Divine Sense of Humor." "Why Do People Laugh?" is Bishop Sheen's take on humor. And, judging from the sense of humor he displayed throughout his lifetime and on his television programs, he was an expert on the subject. Three 30-minute programs on one DVD. Angels have existed from the beginning of time as God's messengers, God's helpers. Today people are rediscovering the existence of Angels and the wonderful work they perform on God’s behalf. The existence of the work of Angels required no revelation to Bishop Fulton J. Sheen, who enjoyed a special prayer relationship with God's spiritual beings. Here is Bishop Sheen's classic television program on Angels and the meaningful role they play in our world. Fulton J. Sheen is eloquence at its very best. In this superb and timeless message, Bishop Sheen's words ring with answers for today's realities and changing world. They offer inspiring guidance, encouragement, peace of mind, philosophical daylight called "common sense," and spiritual comfort that touches every heart. As a master storyteller, he subtly connects events to life allowing our private vision to grasp new realities that rise up from old doubts and fears. Bishop Sheen was a first in television, a triumph of spirit over limitations. He was an author, columnist, editor, orator and a world citizen of peace.